Everyone learns in a differently. While the end goal may be the same for many children (to learn and practice a musical instrument), they may not reach that goal in the same way. Take a look at the different ways people can learn an instrument, and how that incorporates people’s different styles of learning. Below are the different styles of learning. Each person may have one primary way of learning, or several ways that they tend to learn best. Auditory. Auditory learners use their ears to process information. They learn best by hearing information. Musically, they can recognize rhythm and melody. Kinesthetic. A kinesthetic learner uses their sense of touch to retain information. Movement helps them, and their muscle memory develops quickly. Logical. A student who is a logical learner will best catch on to concepts, patterns and relationships. Numbers also tend to make sense to these learners. Social. As you may have guessed, children who fall into the social learner category often learn best with other people. Solitary. Learners who are solitary are exact opposites of social learners. Solitary learners prefer to process information and practice by themselves. They like to follow a self-paced plan. Verbal. Verbal learners need to talk things through to increase understanding. Whether it’s with other students or just their instructor, conversing about a concept will help them process information faster. Visual. Lastly, we have visual learners. These learners process information that they can see - it is helpful for them to have visual examples such as diagrams and drawings. Nearly every one of the options below will utilize the auditory, visual, and kinesthetic learning styles. Yet for each method, there are learning styles that tend to be more prominent than the others. All of the following ways to learn an instrument are offered at every Creative Soul location. 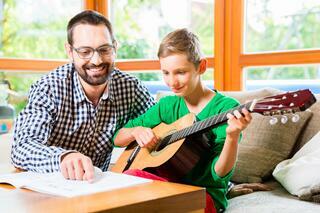 In private lessons, a student gets one-on-one training and lessons from their instructor. Each instructor will keep in mind the goals of your child and work to build their skill - even if they’ve never taken a class before! While many other learning styles are incorporated into private lessons, visual tends to be the most prominent. With the instructor teaching, the student gets to watch their actions and the teachers can stop to explain a complicated concept by showing them directly. Being able to have one-on-one conversation with an expert enables students to ask questions and get a clear understanding of the instrument they want to play and how music theory works. Semi-private lessons offer the same attention from an instructor but with a few friends added! This is a great experience that students get to share with their peers. The more, the merrier! 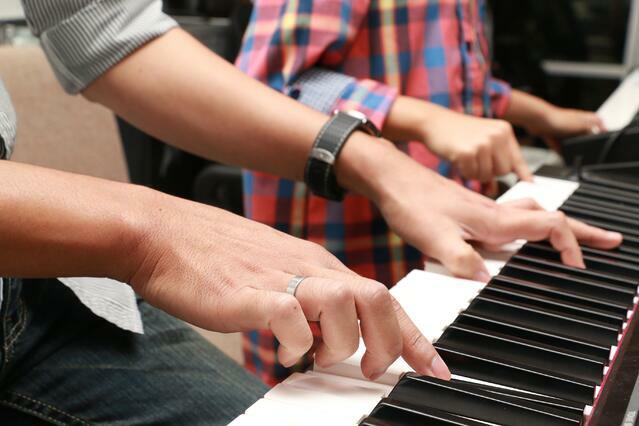 In a semi-private lesson, students get the opportunity to learn an instrument alongside their peers. Because of this, learning may come quicker because the whole group can discuss a concept together. Another awesome experience that students can have with other children their age is by joining rock bands. When a student joins a band, they get to practice their skills, but also get to appreciate the different skills of others on the team. As they work together, they create something that is so cool to listen to. At the end of each term, bands also get the opportunity to perform. In a band there are many moving parts to make music flow together. While your child may play one instrument well, they will get to learn how different instruments can become cohesive to create a smashing performance. To do that, however, they must use their ears and listen to the other instruments as well as their own. If you sign your child up for a summer camp, they will get the experience of socializing with other students with all different skill levels. They will get to learn songs together as well as practice in smaller groups. At camps, the lessons and sessions are very similar to a classroom. With so many students, one or more instructors will be teaching them all together as a large group. Maybe learning in a group - or even being taught by an instructor - isn’t the way your child will learn best. Some children prefer teaching themselves things by either studying books or watching tutorial videos. Self-study essentially revolves around the solitary learning style. Children who learn best by practicing alone may want to just teach themselves! Most jam sessions can hardly be called a lesson. A jam session is when a group of students get together and just play music - no instructors, no audience (usually), just fun! Students who participate in jam sessions tend to have a basic understanding of the instrument they want to learn and use the session to explore and gain experience. It’s essentially a “learn-as-you-go” event. Jam sessions are one of the most laid-back methods of learning how to play music. 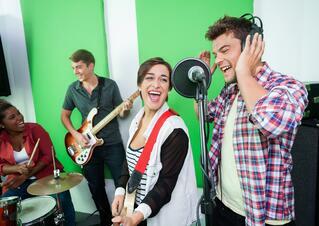 Often, students will watch and converse with other players on how to play something specific. Which way does your child learn best? To learn more about the programs and lessons offered by our school, check out our website or give us a call.